You’re familiar with “amuse bouche” – a sumptuous little treat for the mouth; well, we’re providing you with “amuse yeux” a little treat for the eyes. We can only provide a small sampling, but the archives are so vast, we hope it whets your visual appetite to delve deeper into the world of fashion and flirtation via the delightful, demure, yet seductive handkerchief. Photographing the exhibit was a challenge due to reflections off the display cases, but we hope these snippets wil give you some idea of what’s in store for your enjoyment. You’ll begin with samples from the 1893 World’s Columbian Exposition in Chicago and the Paris Exhibition of 1900, segue into images of WWI & WWII, then delight in a riot of colorful amusements in the ream of Art & Entertainment. The buzz accelerates with a large back-lit standing exhibit devoted to Travel & Adventure – bien sur! 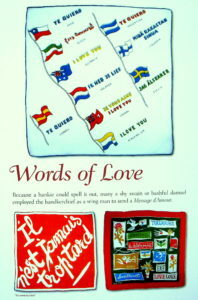 A series of colorful posters will direct you to different exhibits from Fashion to Gamesmanship, and of course L’amour, since hankies were the ultimate flirting accoutrement. Wall cases feature music, dance, sports, and more. This excerpt from the music case features Fred Astaire and Ginger Rogers from the 1935 movie Top Hat, alongside Glenn Miller, alongside the Beatles. 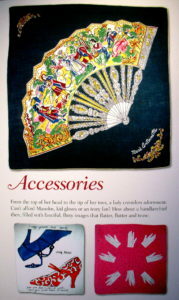 Their images allow us to date the hankies, i.e. Miller died in 1944;the Beatles disbanded in 1970; and the opera hankie in the lower right corner lists births and deaths of famous composers, it only records the birth of Igor Stravitsky (1882), not his passing in 1971, so we know this hankie pre-dates 1971. 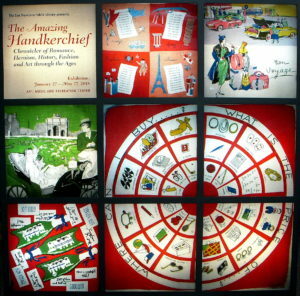 A display case filled with fun and games from chess to cards, backgammon to palm reading. 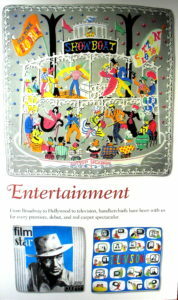 The Entertainment case includes a souvenir hankie from the 1936 movie San Francisco (based on the famous 1906 earthquake) featuring Spencer Tracy and Jeanette MacDonald. You’ll also find ventriloquist Edgar Bergen and Charlie McCarthy. Fascinating fact: Some credit Bergen with “saving the world” on October 30, 1938, when Orson Welles famous War of the Words hoax aired on radio. Some listeners who actually believed Martians had landeds, leapt from rooftops to their deaths. Luckily, most radio listeners were tuned to Edgar Bergen and Charlie McCarthy, thus never heard Welles’ frightening hoax. We also find Blondie, touted as the longest running comic strip to date, it still runs in 2,000+ papers in 47 countries in 27 languages. The beloved character of Little Orphan Annie launched in 1924, inspired a radio show in 1930, film adaptations in 1932 (RKO) and 1938 (Paramount), a 1977 Broadway musical,as well as feature film in 1982, 1999, and 2014. Don’t forget to stop by the poster rack, where you’ll find everything from Rumba instructions from Arthur Murray to tips on how to catch and keep a husband. 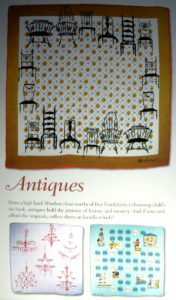 And try your hand at our Hankie in a Hankie Contest for a chance to win a vintage wedding handkerchief. Do Enjoy! No R.S.V.P required. First-come availability. 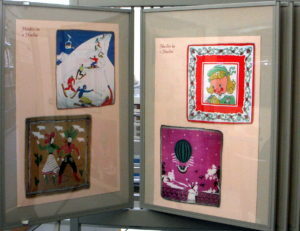 Handkerchiefs have served us in life’s tender moments – catching a bride’s tears of joy, worn over a soldier’s heart as he charges into battle, fashioned into a newborn’s christening bonnet, as well as life’s large celebrations – waving bon voyage from an ocean liner, twirling an overhead cheer “hooray” at the Super Bowl or royal coronation. 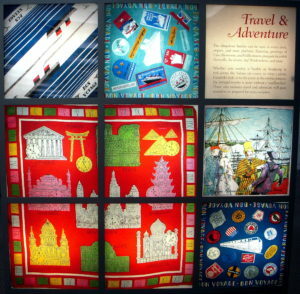 Handkerchiefs were the Pinterest of their day, recording our progression from railroad to air travel, from the birth of television to women’s right to vote, from Shakespearean sonnets to children’s nursery rhymes. We think of them as heroes, many surviving for more than a century lovingly bequeathed to future collectors. Come discover the stories hidden in their folds; let your eye delight, your mind engage and your heart connect with these survivors of history. 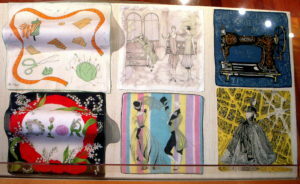 Visit Art, Music & Recreation on the 4th Floor for your chance to win a vintage wedding handkerchief. Rumor has it some videos may be joining the exhibit, like those here. 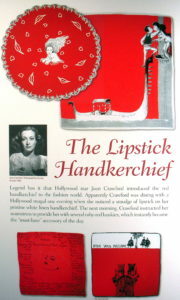 We’ve included samples both serious (WWI & WWII) and lighthearted (Lipstick hankies) to illustrate to breadth of subject matter handkerchiefs encompassed. I’ve seen the exhibit and it’s beautiful, and so well displayed. Looking forward to hearing Ann in person talk about her love of collecting. wish I could visit your exhibition and hear your lecture – sounds wonderful! If you know of a museum or library in Tulsa that would welcome an exhibit and presentation, do let me know. Love to enlarge the world of collecting – of all kinds! 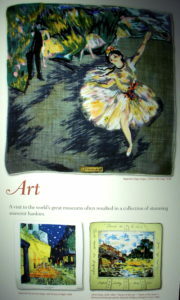 Ann, Your love for hankies is unbelievable. Thank you for sharing.